Dominica is pleased to boast of its Waitukubuli National Trail, which is the Caribbean’s premier long distance hiking trail. The Waitukubuli National Trail was successfully established through the support of the government of Dominica, the European Union and the Waitukubuli Ecological Foundation. This trail is geared at attracting real nature lovers, persons looking for a fun way to exercise and photographers seeking exceptional subjects. This extraordinary trail runs from Scottshead in the south of the island, for 115 miles (184 km), to the Cabrits National Park in the north. The trail slithers up and down the country’s mountainous terrain, and meticulously traces the ridges of this island’s vertebrae. The fourteen segments of this natural wonder retrace the paths used by maroons (runaway slaves) during the slavery era. Thus, hiking through the Waitukubuli National Trail is more than just enjoying nature. Rather, it is an opportunity to relive and revisit the history of the islanders, as one takes part in the journey the ancestors took. Consequently the scenes move from the natural attractions of the island, to historic elements such as the stone wall built by the maroons as seen in Segment 2. Hiking along the Waitukubuli National Trail is indeed a thrilling experience! 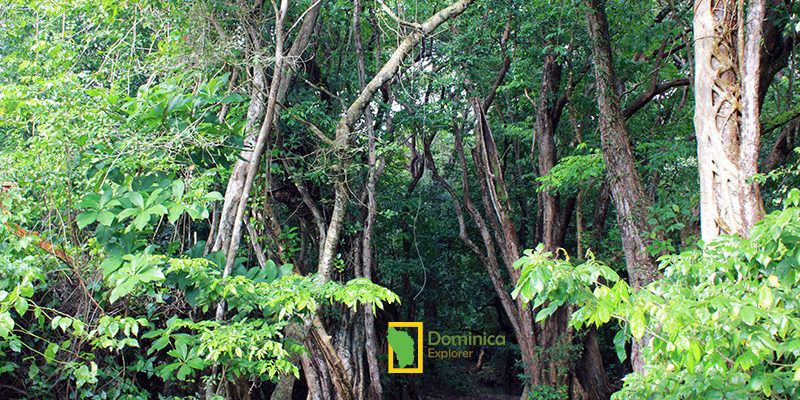 The vast variety of flora and fauna one encounters is a mere indication of Dominica’s truly rich nature as an ecotourism destination. The many farms that the hiker will see along the way, as well as the farmers with backs bent against the sun on a warm tropical day reflects the hard working nature of the Dominican people and will serve as evidence that agriculture is alive and well in Dominica. The crystal, clear, flowing rivers and streams along the journey scream out the presence of water on an island that has always boasted having 365 rivers. The sulphur springs and pools in Soufriere and Wotten Waven allow the hiker a chance to experience the healing wonders of nature as one basks in the rejuvenating water. Mountaintop views of the sky, ocean and scenic valleys as well as villages and hamlets warmly nestled in the valleys make the Waitukubuli National Trail a must. Visitors and locals alike are encouraged to take on the challenge that this trail presents. Not only does the trail test stamina and endurance, but it also serves as a health exercise. To truly enjoy the nature of this island is to know it to the core. Waitukubuli National Trail definitely runs through the core of this island. Hikers, historians, nature lovers, poets, artists and photographers: this is the opportunity to be inspired by nature. Get to know your true potential. Even more so, get to know Waitukubuli. Indeed, “Tall is her body”! I would like to hike sg 1 to seg 4, are the trails marked and easy to follow? The trails are well marked and easy to follow.As you go trekking you may come across farmers going to their gardens,they would be happy to give direction. When you land on Dominica come stay at Big Banana Campground in Soufriere, part of Rodneys Wellness Retreat .We are located 10 mins from the end of the first segment and start of the second segment. The Campground is located adjacent to CarRod`s Gardens ,a botanic garden. I would like to hike the entire trail in March/ April 2013. Does this include the option to summit Morne Diablitons? Do some people hike two of the “easy” and “moderate” segments in one day to save time? Are there lodgings, food and water available in all segments? Logistically, is it possible to leave my large backpack somewhere safe to hike the trail lightly, and retrieve the big pack later? I did all segments last month. You have to camp at the end of segments 7, 8 and 9. No lodging at all there. For most other sections, there are accommodations, but usually they are away from the trail heads, so you will either have to take a bus or hike to the hotels/guesthouses. For example, there’s no accommodation or buses at the end of Segment 10, but if you hike another 2 hours into Segment 11, you’ll pass right next to Picard, which has accommodations. Segment 1 and 13 are really short. I did 13 and 14 together in the last day. I took me 13 days total to finish the whole trail. I recommend hiking segments 7 through 9 with someone, either another hiker, or a guide. This section is very difficult, dangerous, and remote, and if you get injured and can’t continue, you might not see another hiker for days. There’s really not a lot of people hiking the trail. I HAVE DONE ALL THE SEGMENTS ON MANY OCCASIONS AND BELIEVE YOU ME WHEN I TELL YOU DOMINICA IS A BEAUUUUUTIFUL ISLAND NOTHING TO COMPARE. IF YOU ARE A LOVER OF NATURE LIKE I AM, WHEN YOU GET INTO THE FOREST YOU WILL FEEL LIKE NOT GETTING OUT FOR THE BEAUTY IS SO CAPTIVATING IT BRINGS TEARS TO MY EYES JUST THINKING OF HOW LUCKY WE ARE AS DOMINICANS “VERY DIFFICULT TO EXPLAIN THE FEELING”. THE GOOD THING IS THAT ALL THE SEGMENTS HAS ITS OWN UNIQUE BEAUTY. I’M NOW GETTING READY TO DO THEM AGAIN SOON WITH A GROUP FROM FRANCE. Effective July 1st 2013, all visitors and non-residents must obtain a trail pass (ticket) to access/hike the Waitukubuli National Trail. 3. Fifteen Day Pass: For any of the fourteen (14) segments at a cost of US$40.00 (EC$106.80) and is valid for fifteen (15) days only. For more information please contact our office at telephone numbers (767) 266-3593/81 or (767) 440-6125, email us at wntp AT dominica.gov.dm and visit our website: waitukubulitrail.com.